It’s the little things that make me grateful to live in the 21st century. The junk food, for one, is awesome. Not only do we have endless flavors of cereal—from those toasted oatmeal flakes they have at Trader Joe’s to cookie crisp—and chips and candies, but we have all kinds of innovations in the snack department that look straight out of a Silicon Valley startup. Take brownie brittle, for example. 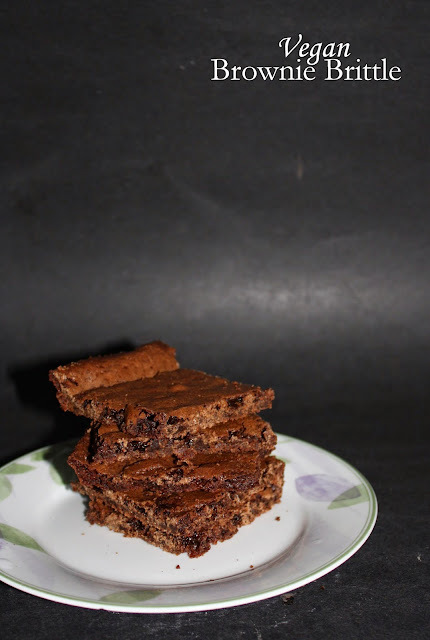 According to Wikipedia, it is the brainchild of Miss Sheila G., a professional brownie-maker who decided one day that she wanted to make a product reminiscent of the crispy edges of a brownie. Pretty genius. The business seems to be going well, if the fancy website with all of its flavors and Instagram photos and whatnot are any indication. Sheila G. is a smart woman. She knows that us Americans like treats; we like convenient, easy-to-munch snack foods; we like crunchy snacks (chips, anyone? ); and most of all, we like salted caramel (well, some of us). Brownie brittle fills all of those requirements. Quick disclaimer: I’ve never actually tried the actual brownie brittle. However, I’ve heard enough about it that I’m pretty sure it’s good as hell. And I’ll tell you, the recipe from Baker’s Royale is good as hell. I’ve been interested in trying the brittle for a while and was excited when I saw Baker’s Royale had a recipe for it. The result? 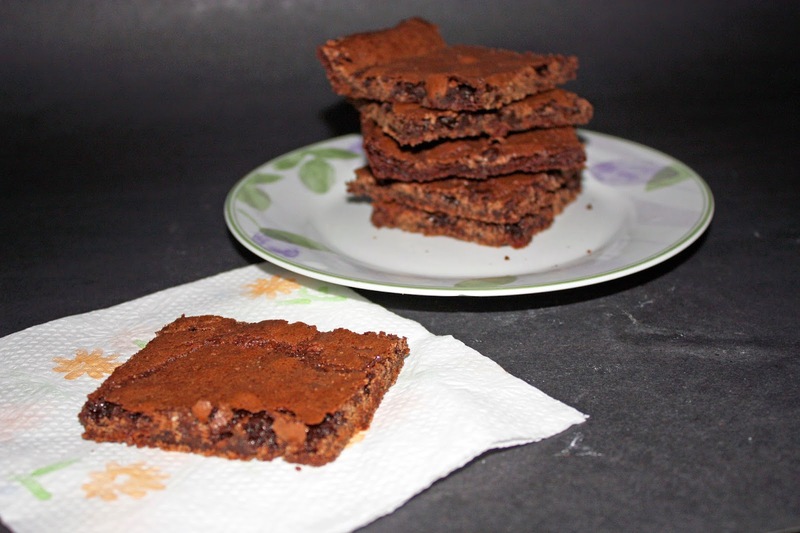 Thin, crunchy brownies with crisp crusts and rich chocolatiness. And don’t doubt the chocolatiness, because there are four whole ounces of melted chocolate in here. Because I only put the batter on a single (albeit a very large) baking sheet, it came out a little thick; so honestly I think it would be better to spread out the batter even thinner than I did—you might get a slightly crispier result then. But who cares? Tastes great as is. And you can bet I’ll be trying some other flavors...like mint chocolate chip...or toffee crunch. Preheat oven to 325 degrees F. Grease two sheet pans and line with parchment paper; lightly grease the parchment paper as well. In a small saucepan, combine chocolate and coconut oil and melt over very low heat, stirring consistently. Stir in sugar, espresso powder, and vanilla. Set aside. In a small bowl, whisk together flour, cocoa powder, salt, and baking soda. Add egg replacer and water to the bowl of an electric stand mixer fitted with a whisk attachment; whisk on medium-high speed until fluffy and foamy, about 3 to 4 minutes. Add chocolate mixture and mix until combined (don’t worry if the “egg” mixture deflates a little—that is all right). Stir in flour mixture. Divide batter between baking sheets, spreading batter as thin as possible. Bake for 20 minutes. Remove from oven and make little scores where you want to break apart the brittle. Bake for another 5 minutes. Let cool completely on baking sheets. Break apart gently and munch. While you’re here, check out some of the other bar recipes I’ve made on here. Lemon blondies with thyme buttercream. A surprisingly fun buttercream flavor! Salty sweet pecan pie bars with bourbon caramel. Because booze makes everything better. Strawberry rhubarb custard bars. Perfect for spring! I feel a little sad now that I've never actually tried brownie brittle. I feel like I need to make a batch and then eat it all to make up for lost time! 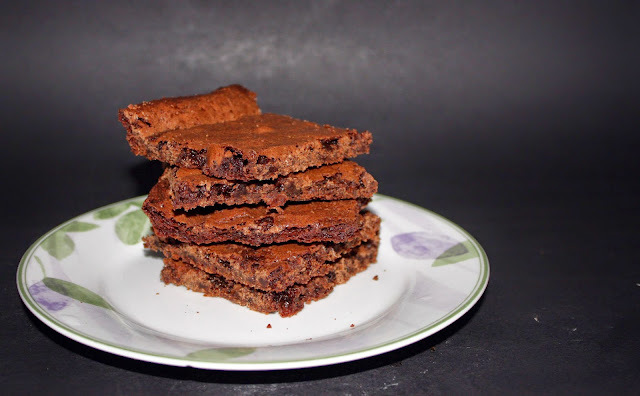 My favourite part of brownies is the crunchy parts, so this sounds like something I'd love. Brownie brittle?? 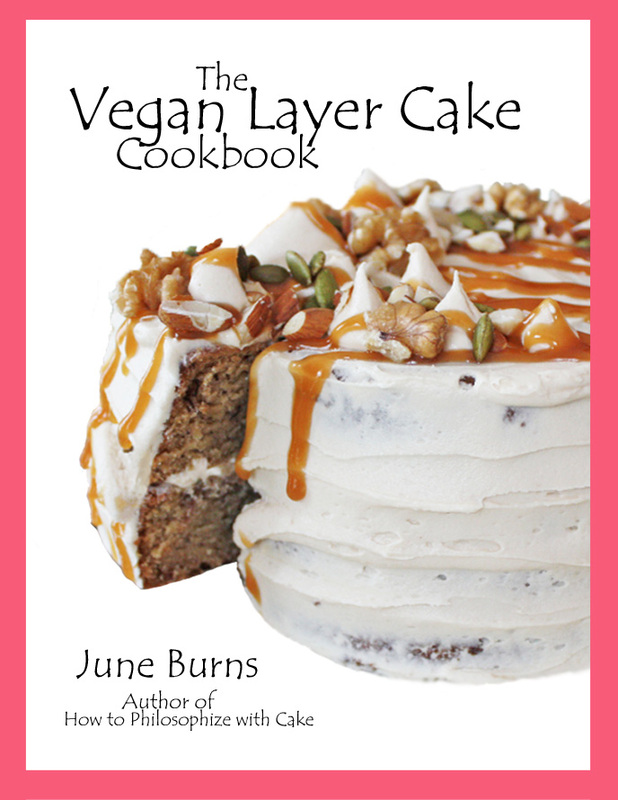 So interesting, sounds delicious!